Writer: Bob Haney. Pencils: Jay Stephens. Inks: Mike Allred. Color: Laura Allred. DC Comics, 2008. 48 pages. Reading this thing, you have to wonder if Bob Haney was aware of his own reputation. Bob Haney is notorious for writing some of the craziest comics of the ’70s. This is the guy that came up with the multi-issue “Saga of the Super-Sons” in which it is revealed that Superman and Batman had teenage sons. We just never heard about them before, because not every minute of Superman’s every day has been documented, don’t you know? 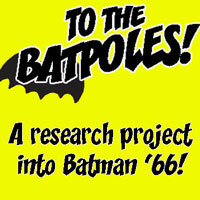 He wrote a famous scene in which Batman strolls down a street in broad daylight looking at girls and thinks, “Sheer magic! Winter’s over and pretty girls are blossoming like flowers! Delicious!” The following caption reads: “Yes, the Batman digs this day.” Haney is the constant subject of Internet ridicule. I even had a jab at him myself a while back. Modern readers tend to balk at any Batman that isn’t scowling, crouched on a rooftop next to a gargoyle. But Haney’s take doesn’t particularly bother me, and in fact I think his approach is a perfect fit for something like Metamorpho which he created with the sublime Ramona Fradon. His best comics are bonkers and fun. Because of that, in order to review this comic, I’m going to have to spoil the hell out of it. 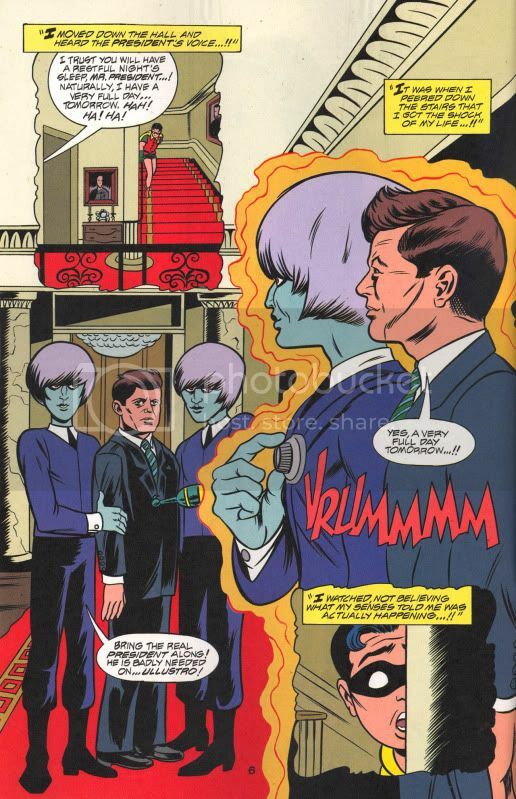 Set in 1963 (the clever opening panel features a billboard for Liz Taylor’s Cleopatra), John F. Kennedy is abducted by an alien species of Beatles lookalikes for his leadership in fighting a (unknown-to-them) meaningless war against another alien race. A duplicate is left behind on Earth in his place. Robin has learned all this while staying overnight at the White House. The Teen Titans head off to space to rescue the brainwashed Kennedy, and Wonder Girl falls in love with an enemy alien before they finally succeed in their mission. Only, they return to Earth to learn that the Doppelganger Kennedy has been assassinated. Since everyone on Earth thinks the President is dead, the Real Kennedy decides to return to the alien planet for the rest of his days and fight for peace, which he does with a fishbowl helmet and ray gun. Now, I knew the plot of this comic including the ending before I read it and it still left me slack-jawed! This comic was apparently originally solicited in 2002, but then cancelled. Haney died in 2004, and then the comic came out in 2008. It’s called a “Lost Annual” but it is no such thing — it was written somewhere between 2002 and 2004. Which is where we came in. This comic is extreme even for Haney. Was he aware of his own “legend” and felt like he had to ramp up the goofballery to meet expectations…? Or did it just come naturally to him? I guess it depends on how forced you think it feels. I generally prefer my superhero comics to be comedic, colorful, and with explosive imaginations. This one certainly fit the bill, especially through the middle. I may have had some reservations about the beginning and ending but they didn’t detract from my enjoyment. I mean, even if Haney went out of his way to set up a final panel of Kennedy as Buck Rogers, actually seeing it, you gotta respect the cajones on the guy. The art by Jay Stephens and Mike Allred is suitably retro. Allred especially has a reputation for being a “mod” artist so he’s a good fit here, but I would have preferred to see the penciling and inking roles swapped. (He tackled the Titans in spectacular fashion once before in his issue of Solo.) There are also sketch pages in the back by classic Titans artist Nick Cardy, who also did the cover. Early this year, The Comics Journal website featured a long interview with Haney conducted in 1997. I haven’t read it, and I kind of don’t want to, because who knows what illusions it will shatter? 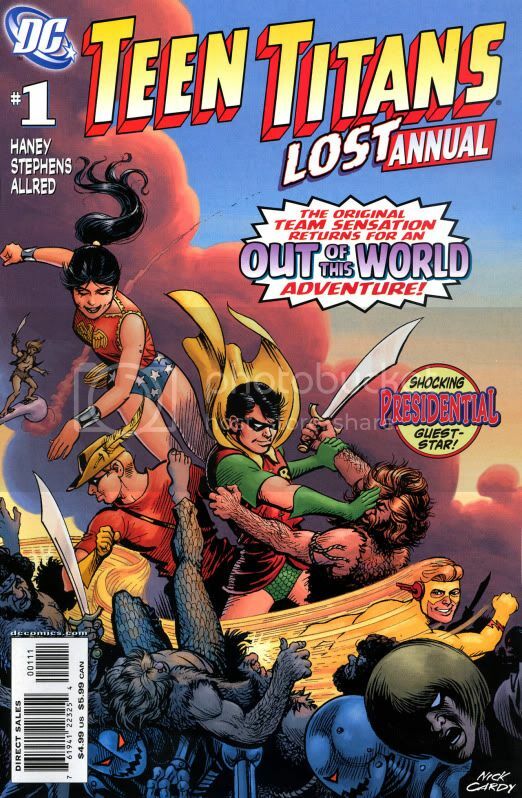 No user commented in " REVIEW: Teen Titans Lost Annual 1 "